The vexing “Unite” coded message. Players figured out what it says, but not what to do about it. The strange basement is one of several mysteries players have been working through in the game, on message boards, and on Discord since The Division 2’s launch two weeks ago. These puzzles, which, like the game’s hidden ducks, are nestled off the main questlines of the sprawling third-person shooter’s open world, have further excited players who already seems largely pleased with the game. Some puzzle solutions have come quickly. Others have been more stubborn, even with hundreds of players working together to crack them. Soon, players started figuring it out. Each riddle, when acted on correctly, would cause one or more extremely powerful enemies called a Hunter to show up. A clue that included the line “gather round the tree to bring cheer and light” involved interacting with a specific Christmas tree. The Hunters are tough but rewarding foes; killing them makes them drop special masks and sometimes an item called an ivory key, eight of which are needed to open a box in the player’s base of operations. For most players, it’s likely they’ll hear a rumor about Hunters, Google for how to activate them, then walk the path blazed by the game’s secret-hunters. That’s been the pattern for how players crack the elaborate secrets tucked into the Destiny games, that regularly updated series about shooting mean aliens and collecting better loot that The Division 2’s adventures about shooting mean people and collecting better loot seems designed to emulate. In series like these, the developers want players to keep playing, and the players often crave more stuff to do. Some difficult, elaborate puzzles add more life to the game, keep more buzz going, and give the player base a chance to split in a constructive way. A small number of dedicated players can devote themselves to putting their heads together to solve the puzzles, themselves setting some of the pace for how the game unfolds for everyone else. The mysterious G. Phillips Protocol mission has a custom icon not used anywhere else in the game, but the mission consists of opening a single door. Players are convinced there’s more to it. Completing Navy Hill Transmission triggers another hidden mission called the G. Phillips Protocol, which is marked on the in-game map with an icon not used for any other mission in the game. The only surprise about the G. Phillips mission so far is that it is anticlimactic. It ends the moment the player opens a door to start it. Beyond that door is a hallway, and downstairs from the hallway is the mysterious basement. No one has figured out what might happen beyond that. “It just kind of didn’t make much sense ending with nothing,” Jaglowski said. Players like Jaglowski have tried a lot of things in that laundry room, including trying to parse whether a blinking light is sending Morse code. Jagloswki has spend several hours doing online research, reading about a real man named George Phillips, a Medal of Honor recipient who died in World War II. He’s cross-checked the locations for the missions, noticing that the Naval Hill Transmission seems to be set where the CIA predecesor agency, the OSS, was originally based. 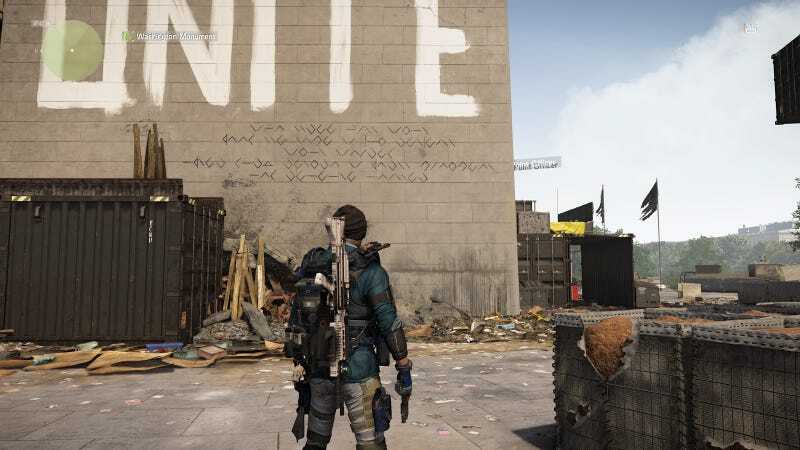 He’s wandered The Division 2’s D.C., and earlier this week posted a video showing that there is a very similar laundry room to the G. Phillips one in the southern part of the map. He’s kept a thread on the game’s subreddit cataloguing his research and discoveries.